A streaming::Algorithm is an algorithm that can be used in streaming mode. It is very similar to a 'classic' algorithm, but instead of having inputs and outputs that you need to set manually each time you want to call the process() method, they have input stream connectors (called Sinks, because data flows into them as water in a sink) and output stream connectors (called Sources, because data flows out of them). Connections between two algorithms (actually, between a source and a sink) represent a flow of Tokens, which can be of any type, as long as the Source and Sink are themselves of the same type. A token is the smallest unit you can have in your stream. For example, for an audio stream, the token type will be Real, because a single audio sample is represented as a Real. A frame cutter which outputs frames will have the Token type set to vector<Real>, because you can't take smaller than that, otherwise the frame would be incomplete. A framecutter is then a strange beast, because it has a Sink<Real> (input is a stream of audio samples), but has also a Source<vector<Real> >, because it outputs whole frames one by one. This might seem strange, but is not a problem at all. NB: of course, the input of the framecutter will consume tokens much more quickly than the rate at which it produces output tokens (frames). That is not a problem at all. This is a non-blocking function. Referenced by DiskWriter< T >::process(), and VectorInput< TokenType, acquireSize >::process(). Declare a Sink for this algorithm. The sink uses its default acquire/release size. Referenced by Copy< TokenType >::Copy(), AlgorithmComposite::declareInput(), DevNull< TokenType >::DevNull(), DiskWriter< T >::DiskWriter(), FileOutput< TokenType, StorageType >::FileOutput(), PoolStorage< TokenType, StorageType >::PoolStorage(), and VectorOutput< TokenType, StorageType >::VectorOutput(). Declare a Sink for this algorithm. The sink uses n for the acquire/release size. Declare a Sink for this algorithm. The sink uses the given acquire/release size. Declare a Source for this algorithm. The source uses its default acquire/release size. Referenced by Copy< TokenType >::Copy(), AlgorithmComposite::declareOutput(), and VectorInput< TokenType, acquireSize >::VectorInput(). Declare a Source for this algorithm. The source uses n for the acquire/release size. Declare a Source for this algorithm. The source uses the given acquire/release size. Disconnect all sources and sinks of this algorithm from anything they would be connected to. Referenced by essentia::streaming::connect(), and VectorInput< TokenType, acquireSize >::setVector(). Returns the names of all the inputs that have been defined for this algorithm. Returns the names of all the outputs that have been defined for this algorithm. 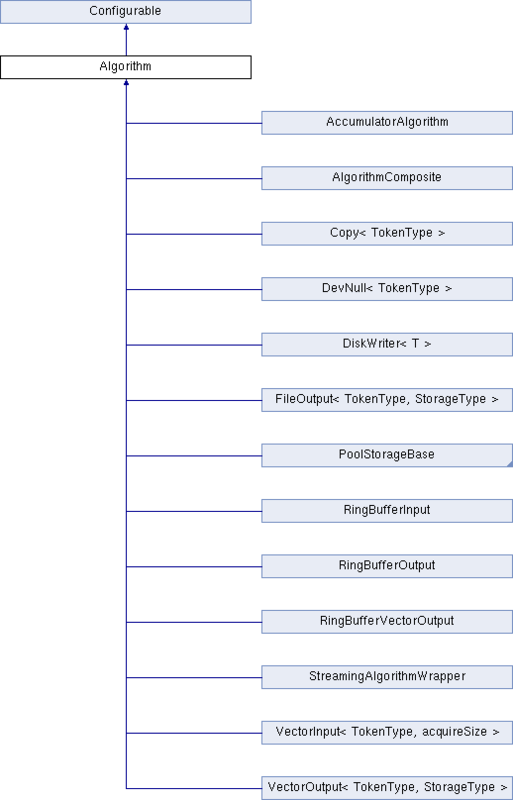 Implemented in VectorInput< TokenType, acquireSize >, FileOutput< TokenType, StorageType >, StreamingAlgorithmWrapper, AlgorithmComposite, PoolStorage< TokenType, StorageType >, AccumulatorAlgorithm, DiskWriter< T >, VectorOutput< TokenType, StorageType >, Copy< TokenType >, DevNull< TokenType >, RingBufferInput, RingBufferOutput, and RingBufferVectorOutput. Reimplemented in VectorInput< TokenType, acquireSize >, AlgorithmComposite, VectorOutput< TokenType, StorageType >, StreamingAlgorithmWrapper, AccumulatorAlgorithm, RingBufferInput, RingBufferOutput, and RingBufferVectorOutput. Referenced by StreamingAlgorithmWrapper::reset(), and VectorInput< TokenType, acquireSize >::reset(). Sets whether an algorithm should stop as soon as it has finished processing all of its inputs. This is most often called when the algorithm has received an STOP_WHEN_DONE signal (at the end of the stream). Reimplemented in VectorInput< TokenType, acquireSize >.